What better way is there to unwind from a busy week than to attend a Penguins game with Tepper students? 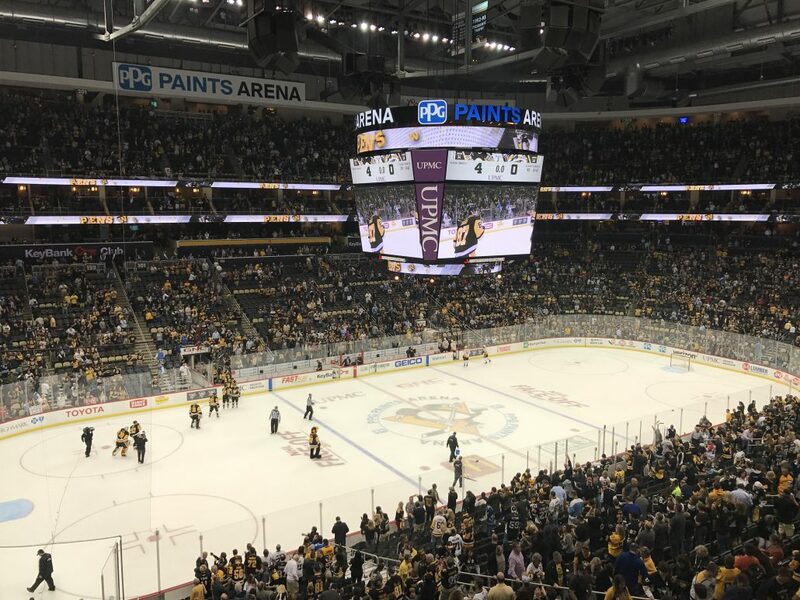 On Saturday, October 7th, around 10 undergraduate Tepper students and 2 faculty members attended the Penguins ice hockey game against the Nashville Predators in the PPG arena. This was an especially exciting game as the Penguins and Predators were the finalists in the Stanley Cup Championships last year with the Penguins winning 4 games out of 6. This would not have been possible without David Tepper, who so generously provided tickets to his box in the arena to the Undergraduate Business Program. Students who were interested in attending the game entered the raffle and winners of the tickets were randomly selected from there. 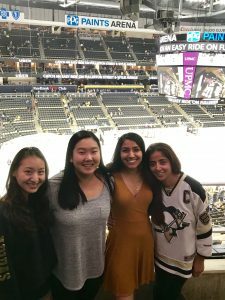 Tepper students (Angela Huang ’19, Pauline Ting ’19, and Riva Fouzdar ’19) and academic advisor Rubab Jafry O’Connor at the Penguins game. I never had much luck with raffles, but was surprisingly selected as one of the many winners to the free Penguins ticket. I was ecstatic as I had never attended an ice hockey game before and I knew that it was going to be an amazing game since the Pittsburgh Penguins are the back-to-back Stanley Cup champions. On my way to the PPG arena, I ran into a couple of friends who also got tickets to the game and we got even more excited. We were directed to the Tepper box, a private suite in the arena, upon arriving at the arena. The suite had an amazing view of the hockey arena as well as a fancy lounge with food and beverages. During the game, we cheered the Penguins on while meeting and getting to know the other Tepper students and faculty members in the suite. It was such an exciting game and the Penguins won 4 to 0! Overall, I had such a surreal experience and can now say that I’ve watched the two-time Stanley Cup champions from a private lounge! Angela is a junior double majoring in Business Administration and Human-Computer Interaction. Born in Los Angeles but raised in Taiwan, Angela loves anything Taiwanese, especially the delicious food. 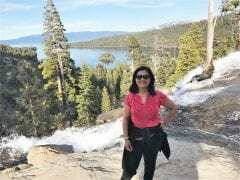 In her free time, Angela enjoys traveling, exploring new restaurants and cafes, and baking. On campus, Angela is heavily involved in the Undergraduate Marketing Organization and also works in the Human-Computer Interaction Institute.